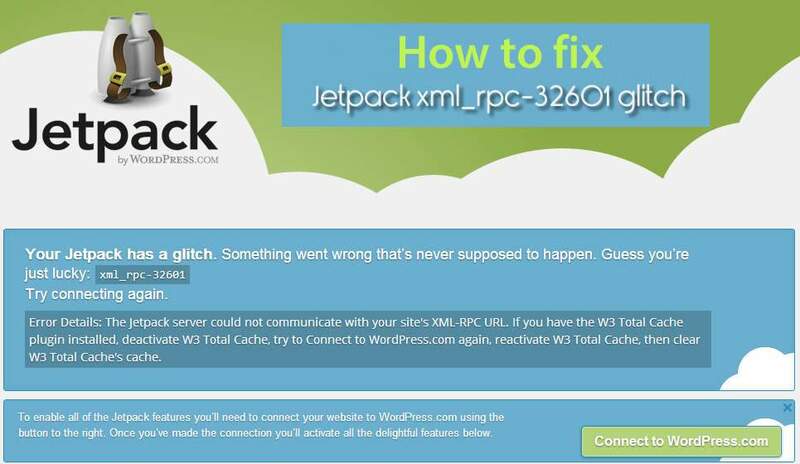 Just recently I was contacted by a client of mine who's using our Managed WordPress Hosting Services, she told me that a Jetpack glitch disconnected her WordPress.com account. Your Jetpack has a glitch. Something went wrong that’s never supposed to happen. 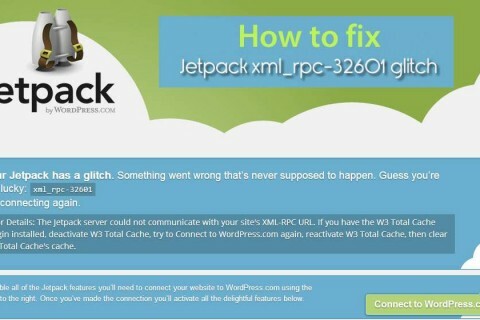 1This the default solution provided by Jetpack itself and its combined with the usage of W3 Total Cache. If you use this cache plugin then its suggested to disable it, try to connect to Jetpack with your WordpRess.com account and once you do re-enable W3TC. You can also try to clear your cache instead of disabling W3TC. 2JetPack has a list of plugins that conflicts with, check it out and see if you have any of those plugins installed on your site. Then disable them and try to connect, finally re-enable them and check if you are still connected with JetPack service. 3Follow Deborah's advice at WordPress.org Jetpack forum for the xmlrpc-32601 ERROR - can't connect to wp.com topic by temporarily renaming your .htaccess to .htaccess-old. [cite]This will temporarily stop your custom permalinks from working, as well as disable any other code that may have been inserted by plugins into your .htaccess file. [/cite] Then try to connect to Jetpack. If you succeed rename your .htaccess-old back to .htaccess. This is what you should be getting: XML-RPC server accepts POST requests only. If you get different results then open your .htaccess and remove some of the rules found in there, save it and reload xmlrpc.php urls. Repeat until you find the conflicting .htaccess rules. Do you need some more help in repairing this Jetpack glitch?